beautifully hand printed medium (8 * 8) eco friendly Jute bag, made entirely to your requirements. Show your personality with a completely unique bag made especially for you. Medium Jute bags are 8inch x 8 inch made from eco jute material with thin plastic lining. All come with a bow on handle, label and certificate of authenticity. Personalisation requirements (Please leave as a note to seller) • Name or wording • Cartoon image • Floral Print • Flower Print • Any additional accessories. We love happy customers so please feel free to message us if you have specific requirements. Jute Bags For Return Gifts | Jute Bags For Eco Awareness | Jute Bags For Wedding Anniversary | Jute Bags For Corporate Return Gifts. This tote is a true carry all! VERY generously sized at 18x16x14.5 inches. Use it as a beach bag, a market tote, or a teacher tote. No matter how you use it you won't regret it! Thick double stitched rope cotton handles are easy to grip. The jute is laminated on the inside so that nothing frays against your items. It is open tote style with no inner pockets or zipper so you have easy access to your necessities. If you'd like a different color monogram please request it in the notes to seller section of your order. Thanks for looking! 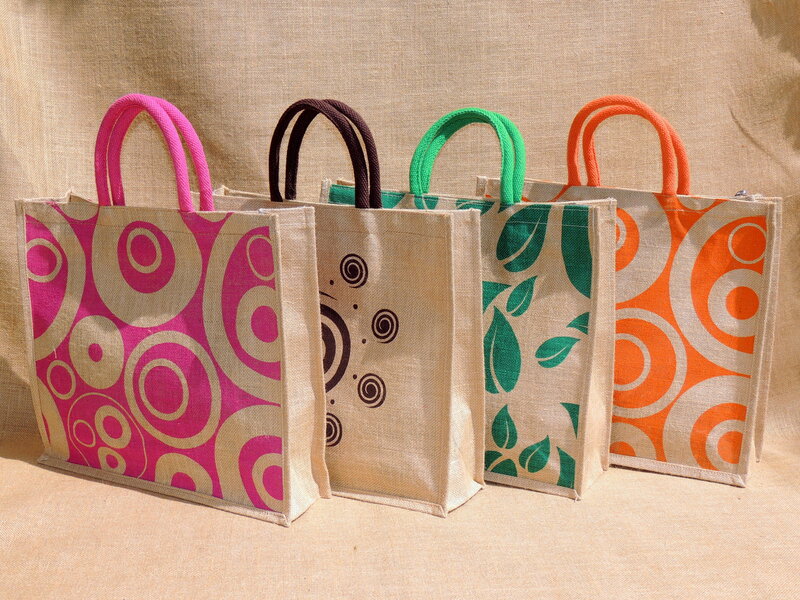 Saran Jute Bags From Hyderabad, Is a leading Jute Bags Manufacture. Kids Lunch Bags with Customized print on it, Kids will love taking the lunch box in these Jute Bag because of cartoon character printed on it, the kids who usually don't want to take lunch box to school should be given these bag along with lunch box. For Enquiry you can contact us on mobile\whatsapp : 9866027027, 9701000234. Saran Jute Bags in Hyderabad is a leading Jute Bags Manufacturer . We deal with High Quality Jute Material to Manufacture Bags. We are supplier and exporter of Jute Bags . This Ladies Lunch bags are available with various sizes. Ladies Lunch Bags are Eco- friendly, bio-degradable and durable which doesn't harm to the Environment, Promote your Business and Events by using these Jute Bags. #UseJuteBagsandStayGreen. Like our Facebook Page for more Updates : https://www.facebook.com/Saran-Jute-Bags-323575157681423/ Follow us on Twitter for more Updates: https://twitter.com/SaranJuteBags Our products will be available in #Mehdipatnam #ShilparamamHyderabad #Labbipet #Vijayawada #DilipSuperMarket #Manikonda #DilipSuperMarket #AlkapurTownship #BalajiGrandBazar #Kondapur #BalajiGrandBazar #Mehdipatnam.